Picking up where we left off last week, our focus remains where the US dollar is headed next and the interesting and somewhat peculiar economic and monetary backdrops it will undoubtedly be motivated by. 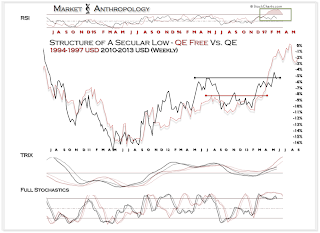 With a seasoning of flavors that has recently confused many participants palates; namely, a gathering disinflationary trend, slouching commodity prices, a mixed bag of economic data - and a Fed compelled to tinker with a taper, we wonder how in control of this fusion menu they really are. With that said and perhaps with a pinch of hyperbole, we remind ourselves there is a fine line between creativity and chaos, genius and insanity and for this instance - deflation or inflation. Our suspicions remain - they (the Fed) are limited by their picked pantry of monetary measures that needs to be sparingly and creatively sprinkled, to inspire a lasting experience with just a hint of inflation that neither scolds the taste buds or is missed entirely. To put it mildly, they need to retain their three stars from the Michelin Guide for monetary cuisine on a shoe-string budget and with one hand tied behind their back. As we recently have focused on, the rally in the US dollar index appears to be in jeopardy of running out of upside momentum. 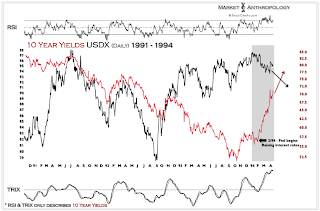 And while that possibility seems logically unlikely if the domestic economic data firms around the idea of a taper, the parallels to 1994 - that of a rising rate expectations environment that fails to inspire the dollar may hold some clues. 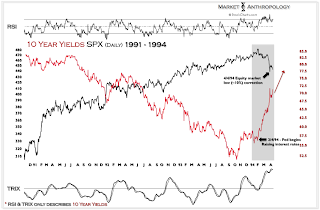 1994 was also the first time the Fed began to materially raise interest rate expectations following the Savings and Loan and banking crises that culminated in the fall of 1990. Here's a snippet from Floyd Norris back in 94' framing the unusual asset dynamics following the pivot in interest rate policy and posturing in February of that year. 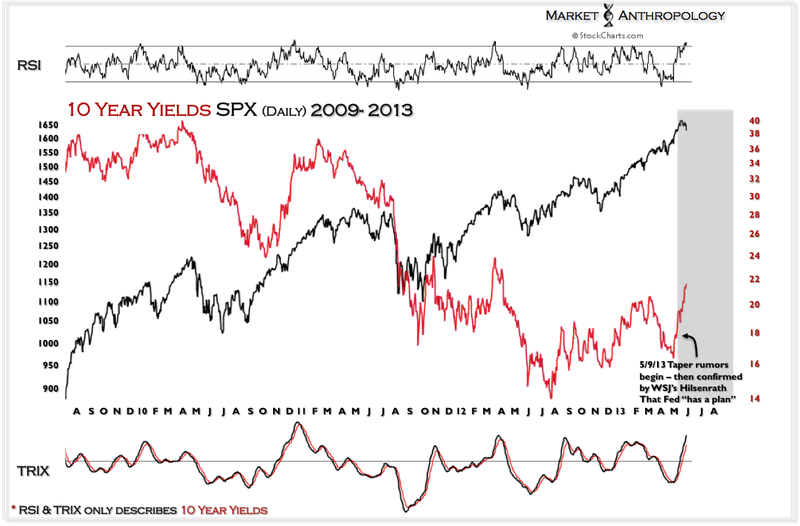 "....The bad medicine in this case was the Fed's decision to raise interest rates. 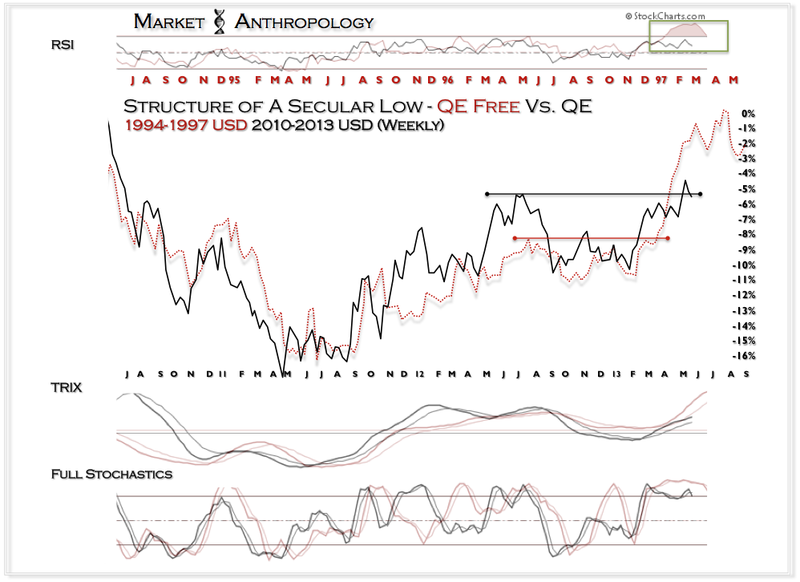 In normal times that ought to help the dollar by attracting foreign funds. 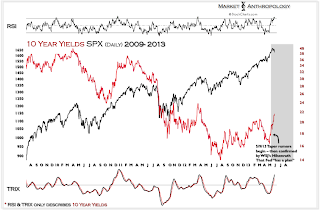 That perverse reaction is another indication of the truly massive speculation that had been going on regarding American interest rates. No one knows just how large, or how leveraged, were all the bets on the bond bull market. In some cases, like Procter & Gamble's misadventure with interest rate swaps, it appears that even the gamblers did not understand how big their bet was. Those bets are now being unwound. 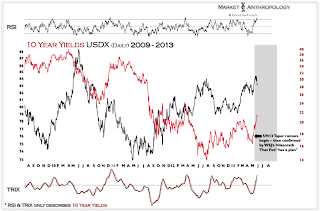 Rising interest rates are a reason to get out of the bond market, and, with American short-term rates still under European ones, there is a temptation for those abandoning Treasury bonds to get out of dollars as well. The unwinding of that speculation helps to explain why everything can fall at the same time, as happened Friday when a surprisingly strong employment report sent bonds plunging -- pushing the yield on 30-year Treasury bonds above 7.5 percent for the first time in the Clinton Administration -- while both stocks and the dollar suffered along with it. None of that has much to do with economic fundamentals, which is one reason why intervention in foreign exchange markets is easier to justify now than at other times. But simply because there was so much speculation on ever-declining interest rates, it is hard to tell how long the perverse effects of unwinding that speculation will last." 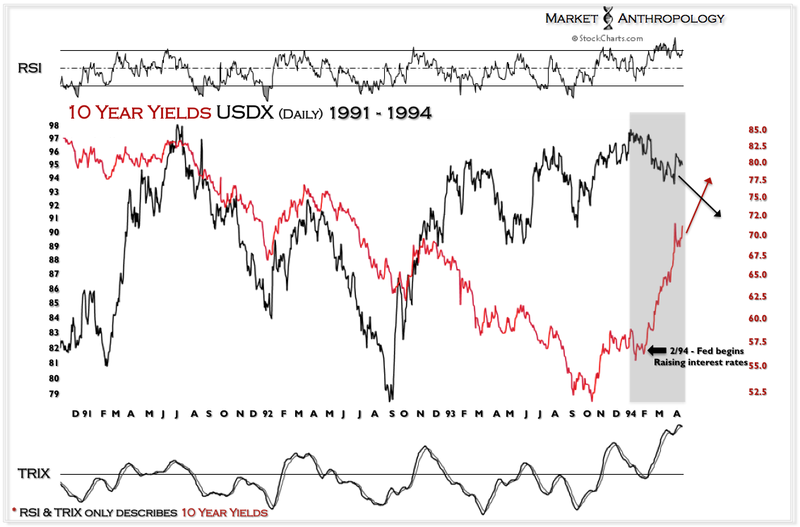 Although we still expect 10 year yields to eventually roll over again and tag the bottom rail of their long-term trend, there's symmetry in considering the shift in the current rate expectations environment with what transpired in 1994. 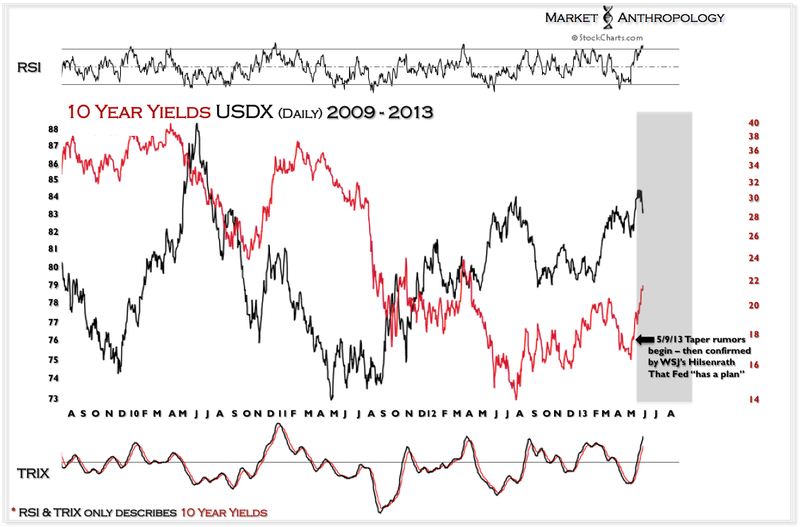 Moreover - and as we alluded to last week, there's a strange elegance in transmission when considering one of the prime benefactors of a declining dollar here would be a rejuvenation of inflation expectations just as they flirt with historic lows - and the commodity sector which has provided a tailwind to such trend. A "perversion" of a different kind, but one Bernanke could wear discretely by ultimately tapering much later down the road. In essence, all bark and no bite. 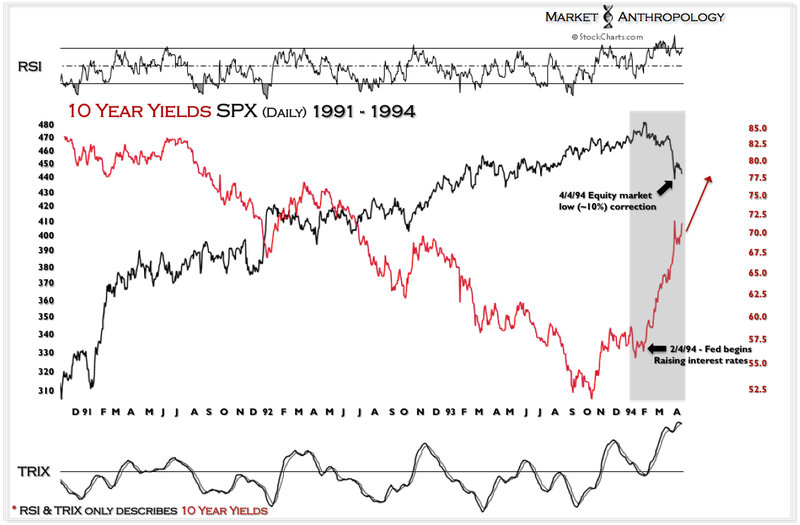 Be that as it may, we believe its reasonable to expect that like 1994 - the equity markets correct swiftly while participants expectations shift. Of course there are some glaring motivational and structural differences - from Greenspan's primary concerns in 94' with rising commodity prices and Volcker's historic battle with inflation; to Bernanke's kitchen, where we would argue there presents the more difficult - yet appropriate assessment of qualifying recent economic growth and knowing the dismantling sides of deflation or inflation is only a few accidents and missteps away. 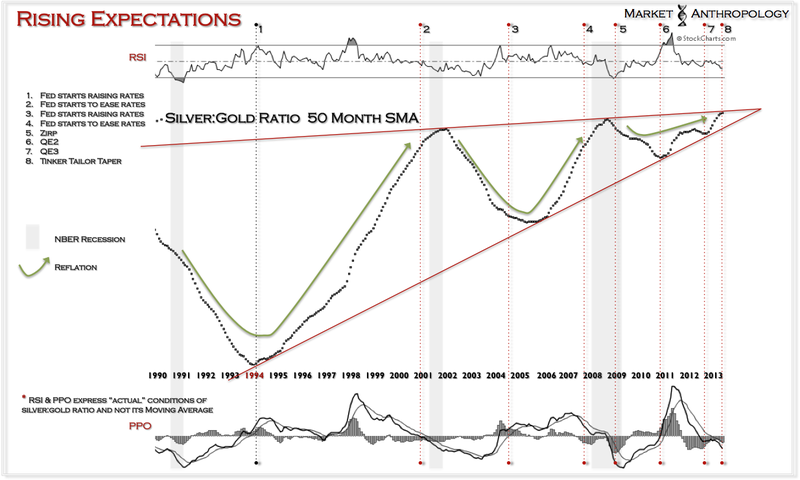 We feel a good presentation of this challenging environment is our long-term chart of the silver:gold ratio we publish from time to time that expresses these "funneling" inflation expectations with a rising degree of difficulty for the Fed. We've come a long way since 1994 and the Fed's pantry is down to just a few essentials. Creative seasoning has kept our appetites interested over the past five years, but eventually we need a healthy meal.